People with obstructive sleep apnea have abnormal sleep patterns that involve intermittent pauses in their breathing, or apnea, interspersed with snoring, gasping for air and awakening. Continuous positive airway pressure, or CPAP, machines deliver compressed air at a preset pressure into the airways, keeping them open and stopping the cycle of sleep apnea. A CPAP system has three parts: the unit that compresses the air; a mask that covers the nose, mouth or full face, and a hose that connects the other two components. Individuals who use a CPAP machine often complain of cold symptoms. When the column of compressed air from the CPAP hose passes through the nostrils and into the upper airways, it may dry out the delicate mucous membranes lining the nostrils, states the American Sleep Apnea Association. As the air continues rushing past the dry membranes, it causes irritation, burning and itching. 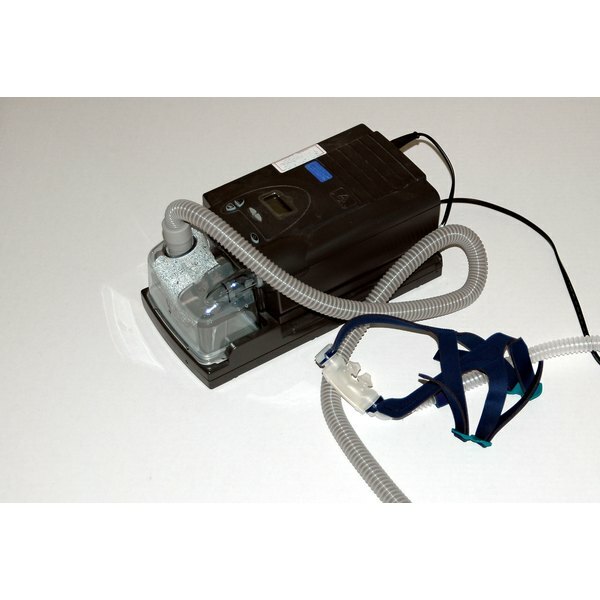 Some CPAP machines come with a built-in cool water humidifier that can be adjusted to moisten the column of air before it passes into the hose. This option works well for many people, but some individuals need a heated humidifier that creates a warmed mist that is less irritating to the nostrils. A leaky mask can increase nasal dryness, according to MayoClinic.com. Continued irritation of the mucous membranes inside the nose can cause bouts of sneezing. Once the irritation is reduced by heated humidification of the air in the CPAP hose, the sneezing will resolve, notes the American Sleep Apnea Association. Many people who continue to use their CPAP machines without humidification may find that their bodies try to resolve the situation by signaling the nasal tissues to produce more mucus. Instead of a dry nose, individuals experience rhinitis, or an unpleasant runny nose, states the National Sleep Foundation. Although it seems counterintuitive to add more humidity to an already runny nose, heated humidifiers help stop the rhinitis, according to the American Sleep Apnea Association.